It's pretty evident from the hundreds of stares it got over the last two days at each and every stop light that the Aquila 250 can draw a crowd. Of all the motorcycles we've ridden this month the Hyosung was, hands down the winner in the 'looks per hour' category. For a stretched out cruiser and despite how small I probably make it look, that still isn't too surprising  India does love cruisers. What is surprising though is this is not an unfamiliar shape on Indian roads. 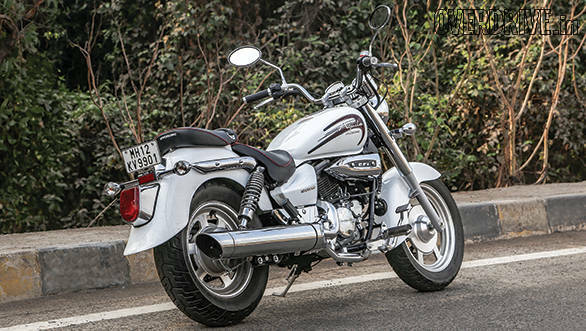 The Aquila 250 of today is an evolution of the same motorcycle Hyosung launched in their first foray into the Indian market in 2003. Yet despite that, all it received were dreamy glances from passers by. So what's changed after 11 years? Truth be told not much and the little quarter-litre cruiser receives just a mild cosmetic makeover and fuel injection. The Aquila GV250 still is a low slung, stretched out motorcycle with a large, classically rounded tear drop tank and big flared fenders. It's heaped with chrome though some of it is plastic coated with chrome. The lines are pleasing and essentially follow a tried and tested, old school formula. The old twin exhausts have been replaced by a much nicer single, oversized chromed collector that flows with the design in a more pleasing manner than the previous upswept design. It rides on large chunky looking alloy wheels on both ends that help with building the illusion that it's a large motorcycle. The ergonomics are also typically cruiser with forward set foot pegs and handlebars that stretch back to you, though it's not as extreme as some larger low riders. The build quality has improved over the older motorcycle but there is still room for improvement. The indicator switches were hard to turn off and the fuel level indicator was very slow to indicate the right fuel level. Not much has changed with the engine and the 250cc, air/oil cooled, 75 degree V-twin now receives fuel injection and makes 26.5PS and 21.4Nm. With peak power being developed at a lofty 9500rpm and peak torque at an equally high 7000rpm you can guess that it's not quite a torquey unit. It does build revs cleanly from as low as 2000rpm but the punch that you associate with a cruiser is clearly missing. You soon find that you have to rev the heck out of it when you want to get anywhere in a hurry. In our performance tests it managed the dash to a 100 in 13.2s topping out at 120.2kmph, not earth shattering performance from a 250cc motor but given that it does tip the scales at 179 kilograms that's quite understandable, it's more of a motorcycle to pose on anyway. It's also quite a rough mill and though it's well mannered at lower revs, above 5500rpm the vibes start to build and once speeds cross 80kmph you notice a distinct buzzing through the bars and foot pegs. As you get nearer the 100kmph mark this buzzing gets quite annoying and then your elbows, back, feet and rear end start to complain. So you're forced to potter around at lower speeds to work around this and it tends to spoil the riding experience. It also means this cruiser is not really happy cruising down the highway and that's not a nice thing. 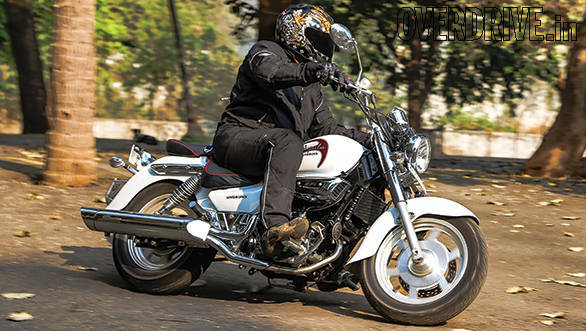 At calmer speeds like our fuel tests the Aquila returns 33.2kmpl on the highway and 28.7kmpl in the city giving it an overall figure of 29.8kmpl  a fair figure for a 250cc twin. With a long wheel base and low ride height the cruiser format is inherently a poor platform to produce great ride quality. 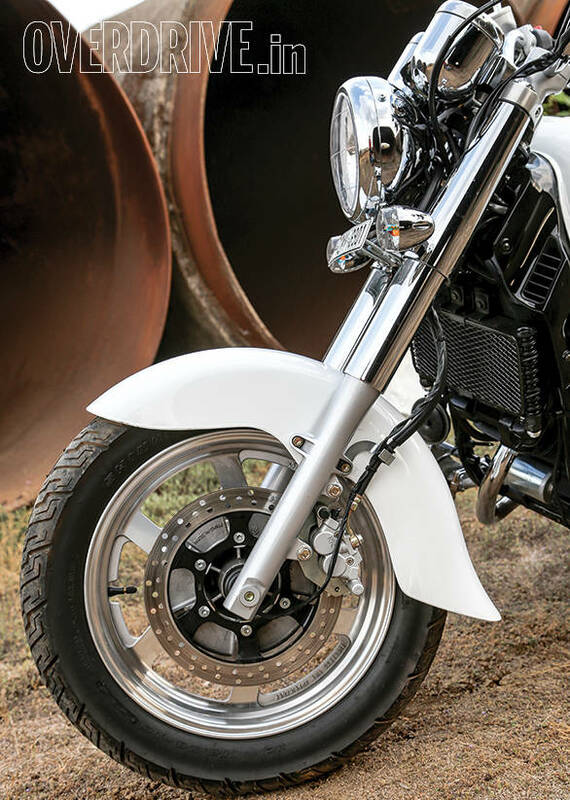 The resulting lack of suspension travel means that some compromises have to be made when setting up the suspension and this is true with the Hyosung as well. Whether out on the highway or in town it fails to effectively deal with potholes or even small bumps and unless the roads are really good the ride turns uncomfortable quite quickly. Despite the raked out front forks it does turn in well and there is a surprisingly good amount of ground clearance on hand. At a fairly brisk pace, bits don't ground out as is the norm with long low motorcycles though the suspension plays spoilsport again and the bike tends to get unsettled through bumpy corners. 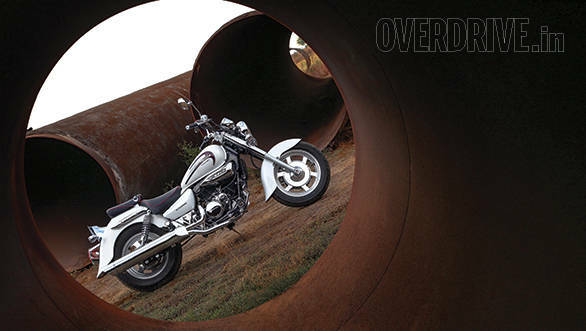 Not much has changed over the last 11 years, the Hyosung Aquila 250 is, as it was back in 2003, an expensive motorcycle. In Mumbai the sticker price before taxes is Rs 2,82,000 making it quite an expensive proposition. But Hyosung are handicapped by the fact that this is a CKD twin cylinder motorcycle that is being imported. By my logic at least, there are a bunch of motorcycles out there that make far more sense on all counts. If you want a calmer more refined motorcycle then check the Suzuki Inazuma. If you're a bit of an adrenalin junkie then the KTM 390 Duke is most definitely your fix and you'll be left with a fair bit of change for extra gas. You could even join the crazy family of Royal Enfield owners and either the Thunderbird 350 or even the 500 are both cheaper. But Hyosung have put their money on the 'stares per hour' factor that the Aquila 250 clearly excels in. Judging by the fact that their complete first consignment of Aquila 250s have already been pre booked, they do know a thing or two about our crowd mentality.